What are some of the best non-DC/Marvel superhero films? That’s when folks would throw out movies like “The Crow” or “The Rocketeer.” But what about truly original superhero films, ones not based on comics? That’s when you really get down to the nitty gritty of films that hold their own against CGI-filled blockbusters. Before “Unbreakable,” there was “Darkman” and “The Toxic Avenger.” But unlike the latter, “Unbreakable” has spurred some worthy sequels. It’s been discussed online for nearly two decades that director M. Night Shyamalan had always intended for “Unbreakable” to inevitably be a trilogy. The question remained even after the release of “Split,” a trilogy about what or who? So does “Glass” fulfill what fans were told, a satisfying conclusion to the trilogy? Or does it pull a Disney and create the possibility of more sequels? Luckily Samuel L. Jackson’s character doesn’t reveal himself to be Nick Fury all along. Much to the surprise of fans, the throwdown between David Dunn (Willis) and Kevin Crumb as the Beast (McAvoy) happens fairly early on as Dunn is tracking down some kidnapped cheerleaders, the latest in a string other kidnappings and vicious murders in Philadelphia. Police are hot on both their trails though and arrest both before they can spar for too long. Dr. Ellie Staple (Sarah Paulson), is at the scene along with authorities because she wants to study the two for their delusions of grandeur, believing that comic book culture is behind their perceived abilities. Also in custody, and sitting down with Dunn and Crumb for some bizarre group therapy, is Mr. Glass (Jackson). Dr. Staple’s hope is to convince the trio that their super strength and super intelligence isn’t what it seems. While sometimes clunky, everything that feels out of place or misguided eventually comes together in the third act. When everything is said and done, David Dunn (probably because of the salary Bruce Willis commands), seems to be more of a side character in this film. But it’s also not necessarily about the origins of Mr. Glass. We already got that in “Unbreakable.” The movie does have him play a key role, revealing why the film is inevitably named after him. But a good chunk of story outside the trio’s therapy sessions is Mr. Glass and Crumb’s multiple personalities scheming, talking and acting. It’s in these scenes that audiences are treated to every individual inhabiting David’s head. Acting wise, nothing’s quite as impressive or entertaining as McAvoy’s scenery chewing, but other side characters from the previous films provide some emotional weight as they make their way in throughout the film, building towards the climax. It feels a little long, and is as the longest film in the trilogy, mainly because Shyamalan unfortunately falls back onto some poor storytelling mechanics that we’ve seen before with some of his weaker films. He tends to over explain plot points by showing and telling the audience what’s happening. It can feel a little condescending since the film is built around the idea that you’ve seen the previous two films and that you should be smarter than the average moviegoer. I would usually chalk it up to a talking head at the studio, but this is something Shyamalan has done in films like “The Happening” or “The Village.” Luckily he doesn’t do it ad nauseam. “Glass” doesn’t subvert superhero tropes or makes any kind of new critiques of the genre, but it manages to manipulate viewer’s emotions and expectations enough to where everything genuinely feels original. The action is filmed in a way where our imagination, instead of computers, fills the void. Even the simplest things that Dunn or Crumb do, feel grand because of the lives they’re saving and taking. Because they’re not throwing each other into buildings like Superman and General Zod, but instead slowly bending steel or taking their time to punch down metal doors, the story feels more grounded in reality. It helps that every character is morally flawed. The good and evil on display blend together to elicit sympathy and disgust. “Glass” ends up being the weakest of the three films, but it’s still an entertaining finale. Some might be turned off by how it all ends, but I applaud the bowtie. While most directors would have left the door open, just in case the box office receipts warranted a sequel, Shyamalan promptly wrote “Glass” as a final chapter to this superhero story. It feels complete, without the need to tell us anymore or asking us to sit through another chapter, something most superhero movies these days don’t know how to do. Dissociative identity disorder (DID) is more commonly known as split personality disorder (SPD) or multiple personality disorder (MPD). The 90’s was full of daytime talk shows, like Oprah, talking to people who allegedly suffered from the disorder. The TV appearances didn’t add much credence to the ongoing debate over the diagnosis and legitimacy of the mental illness in the scientific and psychological communities. Instead it provided housewives with fodder and a free-pass for Hollywood to rejuvenate one of their favorite horror/thriller tropes. Now in 2017, the disease is back in “Split,” but not without a ferociously unique bite. It’d be unfair to say that Kevin (McAvoy) kidnapped three women from a suburban Philadelphia mall. There are nearly two dozen other distinct personalities in his brain that could have done it or plotted to do it. However, just like his victims, we’ll soon find out that Dennis did it, but not without a little help. The trio of girls will also meet Patricia, Hedwig, Barry, and a handful of Kevin’s other internal personalities. The one victim that “Split” will tend to focus on is Casey (Taylor-Joy). Unlike her fellow captives, she isn’t crying or screaming for help. Casey seems to not only have a grasp on the situation, but an understanding of Kevin. Another person with a deep understanding of Kevin is Dr. Karen Fletcher (Buckley). She’s talked with Kevin and nearly all of his personalities, but she’s unaware of his latest emotional developments and actions. She doesn’t view Kevin as a freak of nature, but as someone/something more. She believes Kevin’s DID makes him superhuman in nature, with personalities that not only control his mind, but his body, enhancing or crippling some of his physical attributes. That’s why it worries her that there are rumblings of a 24th personality, nicknamed ‘The Beast’. But is it just rumors between Kevin’s personalities or is there truly another personality, which can climb walls and feast on human flesh, lurking inside Kevin’s brain? There’s more psychological and emotionally scarring at work in “Split” other than the harmful effects of DID. The mental traumas that Kevin and Casey endured previously before the current abduction predicament are revealed and make them more human. The level of empathy for the inherent villain of the movie, Kevin, is nurtured through light-hearted humor, the innocence of some of his personalities, and the one honest moment where the audience finally meets the real Kevin. 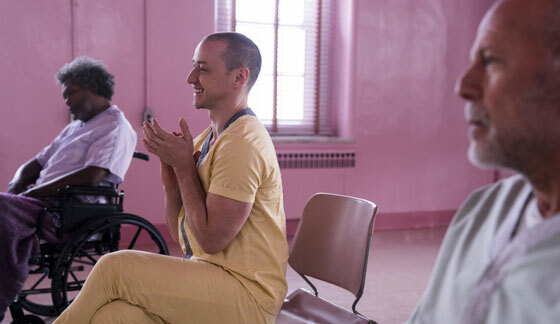 McAvoy and Taylor-Joy find wordless ways to make their characters sympathetic, simply by letting tears well up in their eyes or flashing various facial tics at the right moment. “Split” isn’t quite a return to form for Shyamalan, but more of an evolutionary step in his directing and writing. For years he’s been the twist guy that throws in some jump scares for good measure, but he’s dropped a lot of that in “Split,” relying more on atmosphere and the ability of his actors and actresses. But there’s a light joy to his movie, almost understanding that a movie about a man with DID should surely have a few jokes. Although anyone suffering from the disease and anyone without a funny bone in their body from the medical community would say otherwise. That’s not to say “Split” isn’t without its faults. It runs a little bit too long and sometimes pushes the envelope without any purpose other than to visually or emotionally upset the audience. That may be Shyamalan tinkering with the formula since he is in new territory. “Split” is a restricted thriller, relying more on drawn out suspense and claustrophobic anxiety. “Split” is a slow boiler with enough tension to make you jump at the slightest movement. It also has Shyamalan working with a tragic villain for the first time since “Unbreakable.” If “Split” is Shyamalan’s apology for everything in between “Signs” and “The Visit,” then apology accepted.